A flexplate shield is a transmission system safety part used on competition and high performance cars and trucks with automatic transmissions. 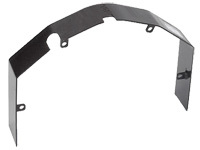 The automatic transmission flexplate shield protects the driver, vehicle, track crew, other participants and bystanders against damage or injury. A 30.1 approved SFI flexplate shield is a safety part required by many competition sanctioning bodies and racing event organizations in order to pass technical inspection and be allowed to compete. The shields available here meet the requirements for use as an IHRA, NHRDA or NHRA flexplate shield. a flywheel, flexplate, or starter ring failure. 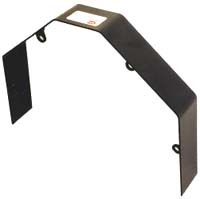 A flexplate shield is sometimes referred to as a scatter shield. The shields listed here bolt between the back of the engine block and the front of the transmission case. You insert the trans to block mounting bolts through the mounting ears on the shield, then through the transmission bellhousing and into the engine block as normal. All of the flexplate shields we sell are 30.1 SFI certified and meet or exceed the requirements of all major motorsports competition sanctioning bodies. Flexplate shields are shipped with the most current SFI 30.1 certification decals available at the time of your purchase. 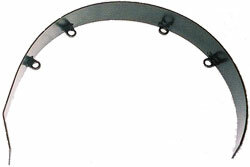 The terms flexplate and flywheel are sometimes used interchangeably. Just to clarify, all of the parts sold on this site are for use with automatic transmission equipped vehicles. A flexplate is what connects the crankshaft to the torque converter of an automatic transmission. A flywheel is used in manual transmission equipped vehicles to connect the crank to the clutch.